SFGH’s burgeoning Community Wellness Program remains committed to enhancing the health and wellness of our staff, patients, their families, and members of our surrounding community. Working with a dynamic team comprised of providers, staff, and patients from the hospital as well as DPH professionals from outside of the hospital, the Community Wellness Program strives to not only offer tailored wellness programs, but also to network with other wellness-focused organizations in the San Francisco community. This will help ensure that everyone has affordable and accessible opportunities to promote their own health and wellness. The program takes a holistic view of health – emotional, physical, mental and spiritual health are inexorably connected with wellness. SFGH’s big wellness picture includes a focus on issues such as community building, financial health, and computer literacy, in addition to physical activity and nutrition. The Community Wellness Program is working to create a hospital culture that encourages our patients and staff to take a more active role in their own holistic health. In that effort, we initiated our first Working on Wellness (WOW!) series in October. Our Fall 2011 program introduced an exciting array of wellness classes and services. Hospital staff and patients stretched and strengthened, boogied and bopped to Afro-Cuban rhythms, soulful sounds, and Bollywood beats. 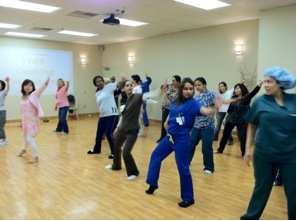 Rhythm and motion, zumba, yoga soul line dancing, Bollywood and salsa sparked energy and enthusiasm among the hundreds of patients and staff participating. The program also offered mindfulness meditation to promote inner calm and healthy cooking classes to encourage healthy eating. Our inaugural fall serie s was a resounding success with over 500 people participating in the WOW series! By participating so enthusiastically in wellness activities, our community demonstrated a commitment to promoting their own health and wellness while bonding with others. Beginning in 2012, we’ll continue our popular movement classes while adding more gentle exercise classes to encourage movement and inspire camaraderie among physically compromised patients and staff.